Today's expedition was originally scheduled to visit Paige's Crossing, but a last minute recheck of opening hours indicated that their coaster would not be operating. 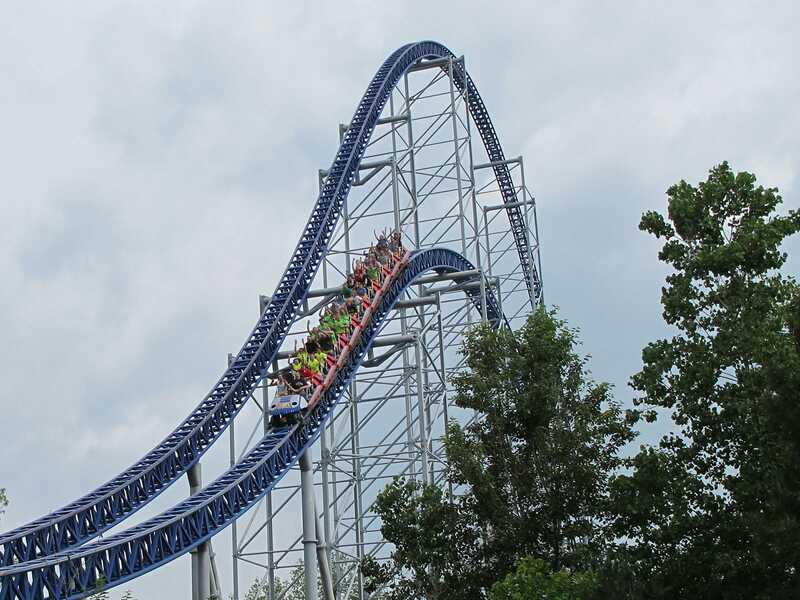 Instead, therefore, we elected to spend a few more hours at Cedar Point, beginning with some early morning laps on Millennium Force. We elected to wait for the front seat, which proved to be extremely intense, far more so than I remembered from last time, though perhaps that's me getting a little older. Regardless of reason, it was a superb way to brush off any early morning cobwebs, and I was wide awake as the train came to a gentle stop in the magnetic brake run. We joined the queue for Top Thrill Dragster right before the official park opening. Quite a lot of other guests had already done the same thing, but even still we'd made it on board within twenty minutes. The launch was superb, sadly powerful enough to deny us the hoped-for rollback, but the rest of the ride passed by without me even noticing. The view from the top was the only interesting feature of what turned out to be a massive anticlimax. To be blunt, the experience was over far too quickly for me, especially given how long the wait times on this ride can be. As an aside, if anyone from the park is reading this I'm curious to know whether the launch mechanism on this ride has been tweaked over the last decade; to be specific, the acceleration seemed to happen over a shorter time than I remembered, with the ride hitting top speed at an earlier point on the launch track. Our next stop was at Iron Dragon, the Arrow-built suspended coaster that feels distinctly past its prime. The first half of the course didn't feel fast enough to swing the cars at all, though presumably they were moving a few degrees in either direction. The second half was better, but just as things began to get interesting we hit the end of the course. Another guest commented in my earshot that he'd never ridden such a boring coaster before, which sadly is a fairly honest impression. As much as I like suspended coasters this one didn't do much for me, though to be fair I'm likely to be forever jaded by the amazing rides experienced a few years ago on Eagle Fortress. A quick lap on Maverick brought us over to the Cedar Creek Mine Ride, another elderly coaster, in this case designed when people were shorter than they are today. It was just about possible for me to shoehorn myself into the seat, but only by crossing my legs, and even then I was wedged in too tightly to be properly comfortable. Naturally this meant that the various bumps on the course were transferred directly to my knees, resulting in a not terribly fun experience. The six year old child in the car in front seemed to enjoy it though. It was nothing like as uncomfortable as our next stop however. Mean Streak now has a trim brake running almost half the length of its first drop, which probably prevents the ride killing people. Today the various cars were shuffling from side to side and bouncing in a fashion that really bloody hurt. The mid course block brake proved a brief respite, slowing the train to a crawl, but even this trimming proved insufficient to make the second half enjoyable. I can think of only two ways to improve this ride; option one would be to extend the trim brake all the way down the drop to the base and construct an unload station there; option two would be to demolish it completely before someone gets seriously injured. We had a much more enjoyable lap on Gemini, which remains fairly smooth other than a rather violent helix at the end of the course. We suffered only slightly bruised eardrums from the vocalisations of a teenaged girl, who sounded absolutely terrified, much to the amusement of everyone else on the train. My only slight complaint was the way that the two trains were dispatched ten seconds apart; a twin tracked coaster like this really should be raced. The last stop of the morning on the way to the exit was the tallest, fastest, and steepest coaster in the world, or at least the ride that claimed those accolades at the end of the eighties. Magnum XL-200 was running very well, with airtime over every hill and only a few noticeable jolts in the track, the worst of which was on the five foot drop out of the ride station. Design techniques have come a long way since this coaster was built, yet even still Arrow's first hypercoaster stands the test of time. Kokomo's Family Fun Center is an particularly nice entertainment facility located in the top right hand corner of Michigan. The site features mini golf, bumper boats, go-karts, Lazer Tag, a moderately sized arcade, and of course a mid sized roller coaster. The Serpent (#1511) was originally built for a park in Kentucky before being moved to the now defunct LeSourdsville Lake in Ohio. After that park failed it was sold on to Kokomo's for just fifty thousand dollars. Moving and refurbishing the ride brought the cost to around a quarter of a million dollars, though any enthusiast riding it today will quickly agree that this has been money well spent. The coaster looks superb in its new location, and rides as well as any Galaxi I've come across. The local region of ACE presented a plaque to acknowledge the preservation effort, which is displayed on the wall in the entrance lobby. 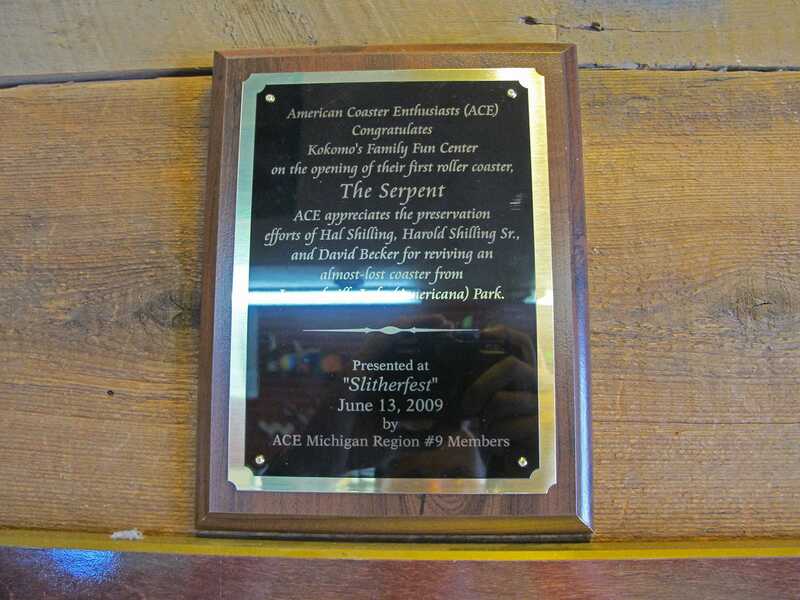 Given the prominence of this plaque it was no surprise to discover that the Kokomo's owner is particularly welcoming to coaster enthusiasts. On quiet days such as today he operates the ride himself, and once he'd figured us for foreign enthusiasts he was kind enough to give us a second lap free of charge. He gave us a full run down of the history of the ride, the synopsis of which appears above; those wanting to learn the rest should go there and ask him in person. You won't be disappointed.